Above: Sketch of the Rendlesham forest UFO by SSgt Jim Penniston (described as triangular/pyramid) which reportedly landed on 26-Dec-1980 at 3:00AM in Rendlesham forest. Taken from USAF SSgt Jim Penniston's official witness statement in 1980 (declassified in 1998 under the FOIA). "Size: 9ft / 2.8m long, 7-8ft / 2.5m high. Fabric: black, smooth, glass-like. Bluish/white glow underneath the UFO, red blinking light on top. No sound. High electric static filled the air, you could feel it on your skin as we approached the object. Movement didn't feel 'normal', it was as if I was moving in slow motion." Next day, Penniston went back at the site and discovered triangular (2.5m apart) landing indentations on the ground where the UFO was, and made plaster casts. Transcript of Ret. USAF SSgt James Penniston interview (2002) who says he examined and even touched the landed UFO and took an entire roll of 36 b/w photographs (which were never released to the public), during a period of 45min on the early morning of 26-Dec-1980. He was accompanied by airmen Burroughs and Cabansag, who remained at a distance, to facilitate communications back to the base, as their radios wouldn't work. Original witness statements collected by british skeptics James Easton p1/3 p2/3 p3/3 (1997) and Ian Ridpath. Below: Identifying markings (inscription with "hieroglyphic" symbols) measuring 3-inches high, stretched for a length of 2.5-feet, etched or engraved on the craft's hull. Re-created from Jim Penniston's handbook notes. 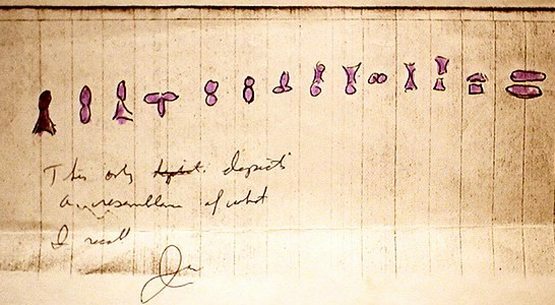 Symbols on UFOs were reported in UFO cases: 1/ Roswell (of purple color hieroglyphics on the "I-beam" seen by Marcel Jr.), 2/ around the bottom of the acorn-shaped Kecksburg PA USA Dec-1965 (replica), 3/ Socorro NM USA 1964 etc. Aerial Photo - RAF Woodbridge weapons storage area as well as the observation tower. According to Colonel (USAF Ret.) Charles Halt (Deputy Base Commander at the time of the incident) and the men with him in the field, the UFO fired "pencil thin" beams of light, at least one of them onto "areas of high interest" -nuclear weapon storage areas- (ref: Halt's comments at 01:22min of SciFi's documentary: "UFO Invasion - Rendlesham", at Larry King panel on 9-Nov-2007 and at NPC conference 12-Nov-2007). Larry Warren said the same in his 2001 NPCC testimony. The declassified report submitted by LtCol Halt a few days after the events. As he explained in later years (ref: 2003 documentary), it was a "sanitized", watered-down version of the events. The Charles Halt Memo. Note: Halt's memo dates are wrong, the events started on 26-Dec-1980. 1. Early in the morning of 27 Dec 80 (approximately 0300L), two USAF security police patrolmen saw unusual lights outside the back gate at RAF Woodbridge. Thinking an aircraft might have crashed or been forced down, they called for permission to go outside the gate to investigate. The on-duty flight chief responded and allowed three patrolmen to proceed on foot. The individuals reported seeing a strange glowing object in the forest. The object was described as being metallic in appearance and triangular in shape, approximately two to three meters across the base and approximately two meters high. It illuminated the entire forest with a white light. The object itself had a pulsing red light on top and a bank(s) of blue lights underneath. The object was hovering or on legs. As the patrolmen approached the object, it manoeuvred though the trees and disappeared. At this time the animals on a nearby farm went into frenzy. The object was briefly sighted approximately an hour later near the back gate. In December 1980, the 3 nights after Christmas (26-28 Dec 1980), a series of UFO incidents occurred in the Rendlesham forest area, which lies between the twin RAF/USAF Bentwaters and Woodbridge bases in Suffolk England, which at the time reputedly held the largest stockpile of tactical nuclear weapons in Europe. UFO sightings at two of UK's most sensitive military sites. Summary: What is the Rendlesham Forest incident? Early morning (around 3:00AM) of 26-Dec-1980 in Suffolk England, a two-man USAF security patrol near the East Gate of RAF Woodbridge observed strange coloured lights above the forest in the direction of Orford Ness. Assistance was requested and a security unit was sent out from Bentwaters. The lights were inside the pine wood and three men, Sargeant Jim Penniston, his driver, Airman Ed Cabansag, and one of the two original security officers, airman (later sargeant) John Burroughs, drove down a logging track that led into the forest, proceeding the rest of the way on foot, owing to the frozen terrain. All three men closed in on an object that resembled an "aircraft on fire", or, as Burroughs described it, a "multiple series of lights." At closer proximity, the lights solidified. Penniston went close enough to see an actual object looming from within the glow (src: Penniston sketch and testimony). Finally, according to airman Larry Warren (who by the way was the original whistleblower for the case, leaking it to the Press using the pseudonym Art Wallace), in a different location, in a field at the edge of the Rendlesham forest, another group of 40 men from the bases, watch a "cloaked" large 30ft across, 20ft high rounded pyramid craft on the ground. The main part was 'pearl-white' with a rainbow colour effect. Warren also says that UFO occupants were seen. (src: Warren's testimony) - Note: other witnesses distance themselves from Larry Warren's version of the events, saying he was "meddled" with drugs and hypnosis by AFOSI. Note: original witness statements in the days right after the event, are misleading. These same military witnesses later testified that they signed prepared statements, minimizing the events (and in some cases threatened -"bullets are cheap"-). Since the official documents have surfaced in 2001, several important witnesses have come forward. My opinion: When I initially came across the Rendlesham case, I had never heard of a small triangular UFO before. So I searched around in greek-speaking (Greece and Cyprus) Internet forums, mailing-lists and old BBS archives, looking for anything similar. And indeed, found UFO sightings, of people encountering small triangular UFOs, dating back to 1992-1993, and two of the sighting reports were made by amateur astronomers. One case was over a village in Cyprus, at very close range of a few meters, hovering outside his front door, at about his house's terrace level - he ran upstairs and saw the UFO from above as well. He described it as a "3m per side triangular craft with a low-pyramid on top, initially the sides of the craft looked like hundreds of very-very small yellow lights, which turned to red before it started to gain altitude and then shot upwards at bullet-like speed". The description of the craft seen in Cyprus matches quite accurately the Jim Penniston (USAF) drawing of the Rendlesham UFO in his report written in Dec-1980 (but AFAIK de-classified and published AFTER the aforementioned sighting reports in Greece were posted in public, intrigued me to look deeper into J.Penniston's sighting). I'll provide the details in the upcoming page I'm preparing, about UFO sightings and CE3 in Greece and Cyprus. Nick Pope was responsible for the UFO desk of Britain's MoD (1991-94): doc1, doc2 and has several official documents on his site. UFO Invasion - Rendlesham.wmv (220 MB) 1hr30min (2003) SciFi channel documentary, about the classic case of UFOs visiting the nuclear-armed US military base at Bentwaters (Rendlesham forest) Suffolk, UK. UFO activity for several nights, then UFO landing near the base on 26-Dec-1980. Testimony from first-hand witnesses, US airmen serving at the base, including the base deputy commander Charles Halt. The UFO(s) seen at close-range by base personell (base deputy commander, 4 airmen) and even touched by security police officer Jim Penniston: He desribes it as a smallish triangular/pyramid UFO 3m (9ft) per side, 2.5m (8ft) high; craft skin smooth like black glass; "hieroglyphic" symbols engraved on left front (see Penniston testimony at 27'-33'). Unsolved-Mysteries Bentwaters UFO re-creation and testimonies (22min). The SciFi documentary is more recent and complete, as once the official MoD documents were released in 2001 first-hand witnesses felt more like talking. Larry P. Warren video interview @ UFO Connection (note: very poor sound quality) - Summary: At the age of 19, he was member of the US Air Force Security Police stationed at the base in 1980 and claims to be a first-hand witness of the incident. According to Larry (who suffered eye damage), he stood within 35ft of a large rounded pyramid craft, he saw a "pine cone" object beaming light and also three "occupants of the ship". In fact, it was due to Larry Warren's actions that the documents of the Rendlesham case were brought to the public, via FOIA.. Other witnesses of the case (ref: Col. Halt comments in SciFi 2003 documentary) have said that Larry Warren had been given narcotics and "worked on" by the DS8 / OSI (Office of Special Investigations), i.e. was victim of mind-manipulation, so that real memories will mix and "if he tried to go public, he'd sound silly". Mike Verrano: "I did drive Williams (Gordon Williams - Base Commander), to an F-16 on the Bentwaters tarmac the AM of the 30th. He had two canisters of 35mm footage with him...He told me directly that it was actual footage of the UFOs on the ground..."
Greg Battram: "I know you were out in that forest 'cause I saw you out there, and we were all on duty with full Personal Reliability Pledge." Georgina Bruni on the Rendlesham UFO "hoax", debunking the "debunkers". Exposes the hoax BBC fed to its audience, i.e. that the Kevin Conde police car practical joke was responsible for the incident (ref: Inside Out). Conde claims he drove a "battered 1979 Plymouth Volare standard issue American police car" into the taxiway, yet the entire incident took place inside the forest. Also keep in mind that Sgt Penniston's team had to leave their military Jeep behind and proceed on foot, because the terrain was frozen.